Senegalese-American singer Akon has announced he is purchasing 50% of Senegalese company Musik Bi to create a music streaming service in Africa that can compete with global competitors. Musik Bi is Africa's first home-grown platform for legal music downloads. It was launched in Senegal in February 2016. Musik Bi is Africa's first home-grown platform for legal music downloads. It was launched in Senegal in February 2016 with the mission of promoting African artists, paying their music properly, and fighting internet piracy. 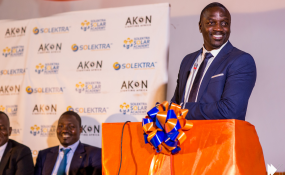 It is therefore no surprise that is garnered the interest of Aliaune Badara Thiam (Akon), a music mogul who has devoted more of his time in recent years to his Lighting Africa solar energy initiative and other charitable pursuits. The super star now wants to delve into changing how the continent listens to music announcing in Dakar that he would become the majority shareholder in the service. He said to BBC Africa that "The music catalogue is Senegalese music but my goal for it is to expand it beyond Senegal," adding that, "Of course it is going to be a platform for Africa in general to be able to distribute your music and be able to stream music as well." He even went a step further to launch his latest single "Khalice", a collaboration with Senegalese superstar Youssou Ndour, exclusively on Musik Bi. However CEO Moustapha Diop, whose company Solid pioneered the project, said ongoing disputes with phone companies over their cut of takings had hindered Musik Bi's reach. After mobile operators take their share, artists keep 60 percent of their income from the service, while Musik Bi take the remaining 40 percent. "We have the ambition of developing across Africa and being 'the' musical distribution platform in Africa," Diop told journalists. "The profit made by the operators is problematic because it goes against the interests of the artists and the platform in general. We will keep pushing to get a reasonable deal," he added. The platform also hopes to broaden into a music festival, television channel and a streaming service, Akon said. Piracy and changing consumer habits have seen record sales drop across the continent, with illegal downloads tempting African consumers looking online for music while copyright enforcement remains relatively weak. Despite these shortfalls the super star believes in sentiments he shared at the Youth Connekt Africa Summit 2017 that the great potentials of the continent will be realized by the vibrancy and talent of the present day generation and that the diaspora should focus on investing and building Africa as it should be built. He is a clear pioneer of how the diaspora and current generations can contribute towards the continents development.